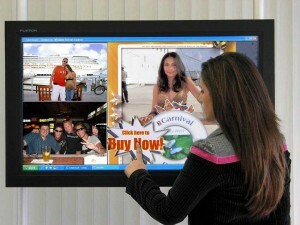 Increase onboard revenue with digital pictures. Recently onboard the Carnival Destiny I was fortunate to be photographed several times by the friendly staff. Pouring over the giant wall of fully developed photographs, I couldn’t help thinking of the I-phone. You know, the nifty screen where you flip through pictures with a short flick of the tip of your forefinger. Had Carnival shifted to digital cameras, the entire photo developing and printing process could be limited to only the pictures actually desired by passengers. It might look something like the kiosk at your local Walgreens. Freeing up a lot of retail wall space for other product. Making it more convenient and easier to find the pictures. By displaying watermarked digital images (categorized by date and time taken) on a few widescreen kiosks, as well as searchable via shipboard TVs, cell phones and even for purchase on the Cruise company’s website would increase exposure and sales. Even friends at home could see and buy them. Bottom line, I know there were a couple of photos I couldn’t locate on the wall. It would have been nice to casually browse for them on the web later from home.